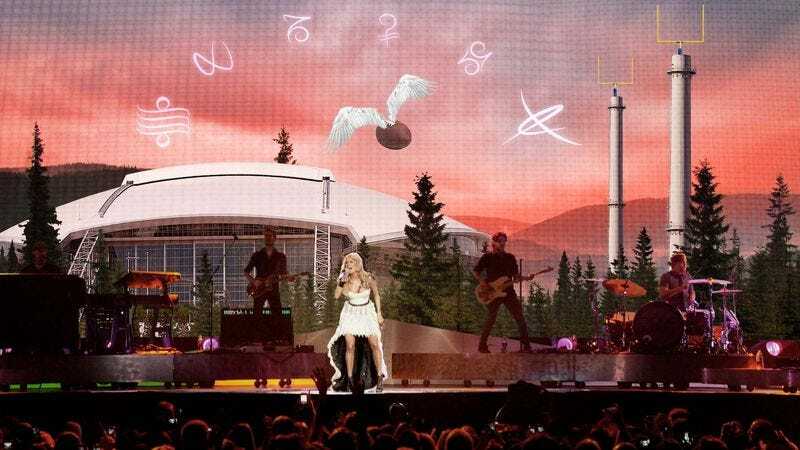 NEW YORK—Providing a unique interpretation of the weekly game broadcast’s iconic introductory music, country singer Carrie Underwood earlier this week debuted her own version of “Waiting All Day For Sunday Night,” a sprawling, multi-part progressive rock–inspired take on the NBC Sunday Night Football theme. Drawing on the musical stylings of legendary prog rockers such as Yes, Genesis, and King Crimson, Underwood’s bombastic performance is reportedly marked by shifting time signatures, lengthy instrumental passages, and abstract, mystical lyrics, all of which serve to highlight the thrills and excitement of NBC’s flagship football broadcast. The 26-minute song will play in its entirety before every single edition of Sunday Night Football, network sources have confirmed. “This song is what football’s all about,” Underwood continued. Although past incarnations of the Sunday Night Football theme have typically taken a straightforward rock and roll approach, with versions by singers Faith Hill and Pink not exceeding the two-minute mark, the former American Idol winner’s seven-part suite reportedly paints a rich sonic tapestry that utilizes analog synthesizer riffs, 12-string guitar arpeggios, and pastoral flute accompaniment. In addition, Underwood’s copious lyrics take listeners deep into a richly imagined alternate realm known as the Gridiron, a medieval world populated by monstrous linebackers, scantily clad harlequin dancers, and winged footballs. Furthermore, the song is paired with a music video in which footage of Underwood performing with her elaborately costumed bandmates is juxtaposed with scenes featuring the cloak-wearing singer journeying deep into the Coaching Tree Woods to do battle with the Blackout, a vicious beast dedicated to destroying all light and beauty in the Gridiron. As in past years, the video also includes interstitial scenes in which various NFL stars are shown preparing for a football game; however, given its sheer length, upwards of 200 athletes, coaches, and front office personnel are now featured. Initial reaction to Underwood’s elaborate conceptual work has so far been positive. “I mean, I’ve had that mellotron part from the halftime interlude stuck in my head all day,” Gaudelli added. The producer additionally spotlighted the final five minutes of the song’s video—following the Dance of the Endzone, a driving 9/8 instrumental passage featuring a frenetic Moog solo from guest musician Keith Emerson—in which Underwood defeats the Blackout in battle, frees a captive Al Michaels and Cris Collinsworth from the Bog of Suspensions, and emerges from the Great Tunnel clad in white for the song’s rousing finale. “And I’ve been waitin’ all day for Sunday night,” Underwood concludes.